Every now and then I do crave something sweet. It’s not often, but when I want it to be good. We were leaving Kenny & Zukes and headed to do some running around and I said I want a coffee and a little dessert. 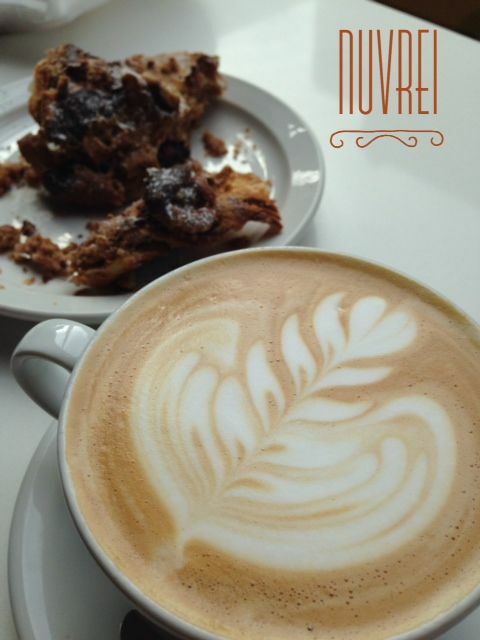 That’s when I grabbed my list and decided it was time to try Nuvrei. When you look Nuvrei up online you will notice that they are big into macaroons. Like a rainbow of colors! We enter the door and head left up a few stairs and walk into this tiny coffee shop/dessert shop. The pastries looked amazing, but I didn’t see any macaroons, but I did see a chocolate walnut croissant. We also saw that they had Heart coffee, so we grabbed a latte. I asked for my usual, white chocolate, which they did NOT have. Instead they make their syrups in house and they did offer a mocha. Not sure it was what I wanted he offered to let me sample the chocolate. It was rich and creamy and had some added spices, so I went for it. For some reason we still had not questioned where the macaroons were…. Our croissant comes out and we tear into it. I kid you not, best chocolate croissant I have ever had. EVER! It wasn’t overly sweet, or too much chocolate. Nope, it was perfect and even extra moist. You can see I tore into it well before my latte ever showed up. My latte was even spectacular. I’m ready to find some Heart coffee beans to bring home to my own latte machine. 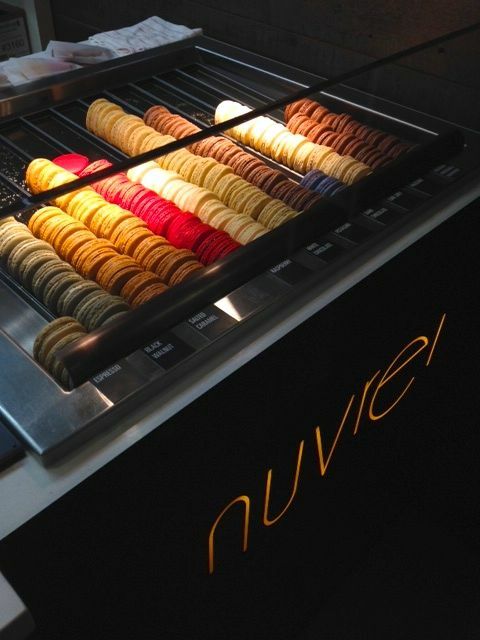 The hidden macaroons at Nuvrei. As we were leaving we said stopped to ask one more question about the mocha and told the guy we had never been in before. He then asked if we knew that the macaroons were now downstairs. WHAT?!? Yep, as you enter if you go right down the stairs it’s all their macaroons, every flavor, every color ready for you. They selection is so big they gave them their own space. That’s my tip for those that don’t know. I do think they need to have a small selection upstairs. At least enough to have people at least question if they have more. We kind of assumed they were out for the day. Atmosphere was a tiny little coffee shop that was bustling. We grabbed a seat facing the street and watched the world go by as we took in all our treats. 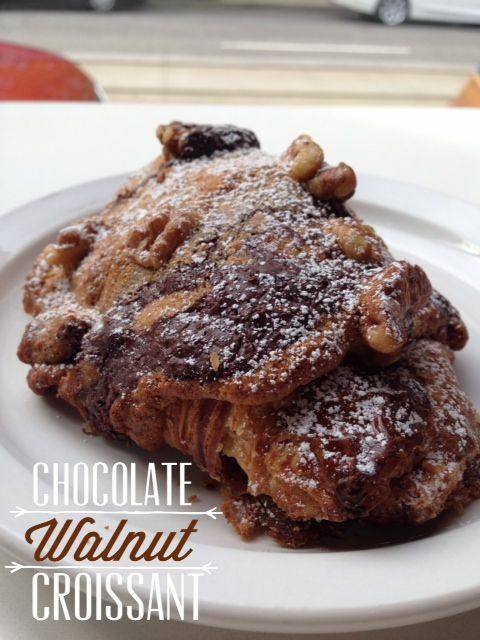 Price was $3.25 for the Chocolate Walnut Croissant. Service was great. As you can tell they were extra friendly and wanted to make sure we had a great experience. Nuvrei is located in the Pearl. I love Nuveri!!! It’s one of my go to places for Macaroons. I’m glad you enjoyed it.